If you're in the market for a midsize sedan that offers almost unmatched practicality and reliability, our team at Matt Castrucci Honda would like to introduce you to the 2018 Honda Accord. After a full redesign for the 2018 model year, the Accord now offers more cargo room and passenger room than past models. The midsize sedan class is known for being fiercely competitive, so how does the 2018 Accord stand up to quality contenders like the 2018 Kia Optima? We're putting the 2018 Accord head-to-head against the 2018 Optima to see which midsize sedan offers the features and specifications car shoppers are most determined to find. Keep reading to learn more! 192 hp; 192 lb.-ft. Engine Performance 185 hp; 178 lb.-ft.
105.6 cu. ft. Maximum Passenger Volume 104.8 cu. ft. The 2018 Kia Optima comes in five trim levels: LX, S, LX 1.6T, EX, and SX. The 2018 Optima's base MSRP bay be slightly lower than the 2018 Honda Accord's, but once you begin looking at the standard features offered by both models, it's obvious why. The 2018 Optima is notably missing a huge variety of features that come standard on the 2018 Accord, including automatic climate control, floor mats, and an anti-theft stereo. Additionally, the 2018 Accord Sedan offers more cargo volume, more passenger volume, more front and rear shoulder room, a larger wheelbase, and more second-row legroom than the 2018 Optima. The 2018 Honda Accord Sedan also comes in five trim levels: LX, Sport, EX, EX-L, and Touring. All five trims come equipped with a 1.5-liter turbocharged inline-4 engine that delivers 192 horsepower and 192 pound-feet of torque, which is notable because it offers a higher level of performance than the 2018 Optima's standard engine, despite being significantly smaller. Drivers looking for more power under the hood have options to choose from, as the Sport, EX-L, and Touring trims offer an available 2.0-liter turbocharged four-cylinder that kicks out 252 horsepower and 273 pound-feet of torque. Additional standard features for all trim levels include Push Button Start, fold-down rear seats, a touchscreen display (size varies based on trim level), Bluetooth® connectivity, at least one USB connection port, and a multi-angle rearview camera with dynamic guidelines. Car shoppers looking for more information about the 2018 Honda Accord, or any other vehicle in our lineup, are encouraged to contact our team here at Matt Castrucci Honda. We'll answer any questions you may have and fill you in on all the details you need to know. Drivers ready to take the 2018 Accord out for a spin are invited to schedule a test drive appointment online or in person at our location in Dayton! 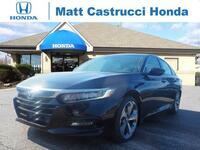 We recently welcomed the 2018 Honda Accord to our inventory here at Matt Castrucci Honda, and we can’t wait to introduce you to the impressive sedan. The 2018 Accord comes with a huge variety of customization options, but one aspect that gives car shoppers the most choices is what exterior color their 2018 Accord will come in. The sedan’s five trim levels each offer a huge variety of body paint color options, so we’re sure you’ll find a color that catches your eye! Keep reading to see all of the 2018 Accord’s color options, and let us know which is your favorite in the comments below afterward!